Here is an article sourced from Platinum Asset Management, one of the better macro economic fund managers in the country. It was written by Philip Ingram, analyst on 1st July 2015. The starting point is that the Greek government has too much debt and it has neither the ability, nor the willingness to repay it after almost seven years of economic contraction. At the end of 2014, the Greek government owed €317 billion and during the year it took in €81 billion of tax and other revenues and had €78 billion of expenses before interest costs. The remaining €3 billion primary surplus wasn’t enough to cover its €7.6 billion interest bill, let alone start paying back debt. Excessive spending doesn’t appear to be the problem. Stories abound in the press of generous pensions and government wastrels, but the cost cutting has been savage. During 2009-2013, government expenditure dropped by 31% from €113 billion to €78 billion. For example, despite unemployment surging from 7.5% to 28%, welfare payments fell by 22% to €38 billion. Nor does tax collection appear to be the issue. There are surely loop holes, but tax revenues jumped from 37% of GDP in 2009 to 45% in 2014. This is higher than Germany at 44% or the UK at 37%. Greece is only paying a paltry 2.4% interest rate so that’s not the problem either. The issue is that Greece has too much debt and its economy has already shrunk by 23% since 2009, similar to America’s contraction during the Great Depression. This is why government revenues dropped from €89 billion in 2009 to €81 billion in 2014, despite the government taking a bigger share of output. The immediate impacts on Greece of leaving the Euro, which is not tantamount to leaving the EU, will be a much weaker currency and a miss-match between Greek banks’ loans, which will be denominated in New Drachma, and their Euro denominated funding from the European Central Bank. The European Central Bank funding arose because it has been propping the Greek banks up by replacing money withdrawn by Greek depositors. For the Greek people, the proximate impacts of a new currency will probably be a significant reduction of their living standards and a period of political turmoil. All of this is important, but the immediate impacts on stock and bond markets beyond Athens should be contained. Europe can contain a Greek default because Greek government debt is only 3% of Euro area GDP and almost €300 billion of the €317 billion is owed to European entities like the European Financial Stability Facility and the European Central Bank, which can print Euros. Another €14 billion is owed to the Greek banking system and a mere €2 billion to foreign banks. A Greek default would not surprise Europe or investors. How would a unilateral Greek default affect politics and policy elsewhere in Europe? Governments in Ireland, Portugal and Spain have been conspicuously hard-line in negotiations with the Syriza-led government, partly out of concern that accepting Greek demands would strengthen anti-austerity parties at home. Certainly, a Greek default may lead some voters in other countries to view default as an opportunity to shift resources from well-heeled foreign creditors to struggling public sector employees, pensioners, those on low incomes and the unemployed. However, a Greek default is more likely to strengthen voter support across southern Europe for existing policies than to precipitate a new wave of defaults. This effect could in turn strengthen the Euro. Historically, governments that have chosen default have experienced a much higher risk of losing political office – due largely to the unusually sharp economic downturns that typically follow default. Given this high risk, incumbent governments in democracies usually do their best to avoid it, which is why Greece’s high stakes negotiating tactics have been so shocking to many of its interlocutors. Default is thus a once-in-a-lifetime experience for most voters; many will never experience it. Compare this with voter experience of standard economic recessions, which have occurred about every five years since 1870 in advanced economies. The main reason why a Greek default is more likely to strengthen support elsewhere for current policies follows directly from voter inexperience with default. Psychologists have shown that people focus strongly on rare and vivid events. They are also more sensitive to the costs than to the potential benefits of policy change. A Greek default and its immediate aftermath would be followed closely in all European countries. Voters elsewhere would be strongly inclined to view the accompanying chaos and economic disruption in Greece as highly relevant to their own national situation. Some voters would also view continued good behaviour by their own country as a useful and attractive counterpoint to economic misbehaviour in Greece. Our research points to the empirical importance of this “network” effect. Since 1870, governments that opted for default against private foreign creditors were far more likely to lose elections when significant numbers of their trading partners had also defaulted. That is, voters punish their own governments much more severely when witnessing default by apparently similar countries. Rather than break a social taboo, a Greek default is therefore likely to instead reinforce voter concerns in southern Europe that such policies are accompanied by unacceptably large costs. Some historical examples illustrate this effect. When a number of other Latin American countries were defaulting in the early 1980s, Venezuela initially appeared as if it would be able to ride out the financial storm that hit the region and avoid the fate of its peers. After a series of bungled negotiations with its external bank creditors, the incumbent Christian Democratic government led by Luis Herrera Campins succumbed to an avoidable default. In 1983, it suffered a landslide election loss. In the early 1930s, another peak period of default in the global economy, Australia also came close to default when prices for its commodity exports collapsed. A populist state Labor government led by Jack Lang in New South Wales unilaterally suspended interest payments on its large foreign debts in 1931 and demanded that the federal Labor government do the same. At the end of 1931, a newly formed United Australia Party government led by “Honest Joe” Lyons was elected on a platform of honourable repayment of all Australia’s foreign debts and severe austerity at home. Lyons was strongly rewarded by voters, being re-elected twice before he died in office in 1939. In a similar fashion, the British Conservative Party since 2010 used the Greek example as a counterpoint to reinforce political support for fiscal austerity at home. The comparison was of doubtful economic validity, but it was politically effective. There were also overtones in this case of one of Joe Lyons’ most effective rhetorical devices – his claim that “British peoples”, unlike those in less sturdy countries, always honoured their obligations. Contrary to Lyons’ claim, there is little evidence that cultural factors play a powerful role. Rather, voters become more cautious rather than more adventurous in the presence of extreme economic misbehaviour abroad. All of this suggests that a Greek default and possible “Grexit” would be more likely to lower rather than to raise the political incentives for other European governments to follow, contrary to the expectations of many commentators and political leaders. This article is based on Networked Default: Public Debt, Trade Embeddedness, and Partisan Survival in Democracies Since 1870. Jeffrey M. Chwieroth is Professor of International Political Economy at London School of Economics and Political Science. Andrew Walter is Professor of International Relations at University of Melbourne. Cohen R. Simpson is Doctoral Candidate in Social Research Methods at London School of Economics and Political Science. Greece - Is the market too complacent? Mark Draper recently met with Nik (Portfolio Manager, Platinum Asset Manager) to ask him whether he believed the market is being too complacent about the risks in Greece. Mark : Mark Draper here with Nik Dvornak, portfolio manager of Platinum Asset Management. We’re talking about Greece today. Now Nik, the market is incredibly complacent at the moment, everyone seems very relaxed with the situation in Greece. Do you think the market is right to be relaxed about Greece or how do you see it? Nik: Well indeed they are very relaxed perhaps surprisingly so given how much turmoil there was two years ago when it seemed like the exact same things was playing out. Look, so a few things have changed. So what has changed? Number one, the exposure of European banks and other financial institutions to Greece is significantly diminished. This partly because government institutions like the stability funds taken on and have taken on some of that debt from the banks and certainly because Greece had worked out some of its debt in the past and those banks have already worn those losses, so their exposure to Greece is minimal. The exposures now lie predominantly with European Central bank (the ECB) and the European governments. Nik: As for whether people are right or wrong to be worried, well clearly they are not very worried at all at the moment. Nik: Where you might have some concern is if a group default does damage the financial standing of some of the European sovereigns that they owe money to or alternatively , you can see Greece is essentially the microcosm for many countries in Europe and what we are seeing here could play out in other countries and I think the market is assigning a very low probability to that, if that probability begins to change and increases in the investor’s minds as we go through subsequent elections in Europe, we could see a period of a lot more volatility ahead. Mark: And we were talking before, off camera, about the effect of quant easing, over in Europe with all of what is playing out in Greece, how does that actually reduce the risk, if you like, of what is going on at the moment? Nik: Yeah, so one of the risks of course will be that Greece defaults, they owe 320 billion dollars to investors and their current debt. A lot of those other investors are other European governments who have very stretched balance sheets to begin with. So the risk is of those investors reassessing the financial stability of some of those European countries and they are reluctant to enter them again. Now what QE does is create a buyer of last resort in for the European central bank which buys these bonds, and you can see that even with all the turmoil in Greece, the Portugese government can still borrow half of a percent cheaper over 10 years than the US government and they borrow it in Euro which is a currency investors don’t really want to hold so the US government is borrowing in US dollar, investors want to hold that currency and they still demand half a percent more of holding US government then the Portugese government did. Mark: And the Italian Government can borrow less than the US, and at this moment as well. Nik: So you know, that just kind of keeps this down with pressure on yields and keeps pressure off the governments and so the idea is that they take out additional loss from Greece, well this buyer of last resorts keeps the fund flowing and the market open, so it stops the knock on effect. Mark: So quantitative easing is a positive thing for controlling the situation but the risks are that politically it could escalate in other countries with extreme political parties getting into power, that would be one of the things to watch. Nik: And that is very much the risk in the background and you are seeing it in France and you are seeing it in Spain but also other countries like the UK which is also part of the zone, so there is that border risk and I guess a lot of it depends on how Greece plays out. If the Greeks give Eurozone and as result their debts get written off and the economy recovers and they have a weaker currency and are able to trade their way out, it may encourage other voters to be tempted to follow the same path. If things turn out very horribly for Greece, if it worked the other way, pushed people back to the political centre, away from the extremes, it might actually be good for. Mark: So it’s being controlled at the moment, in this certain situation, it is definitely worth monitoring from an investment perspective and Nik, thank you very much for your time. The Greek government in April issued an emergency decree ordering local and regional governments and public agencies to hand cash to the central Bank of Greece so it could pay wage and pension obligations and make an imminent repayment to the IMF. Such a desperate ploy only highlighted what has been obvious since Greece’s 100 billion euro (A$139 billion) default to private creditors in 2012; that bankrupt Athens, now owning debt worth 177% of a broken economy, must soon miss payments to its official creditors. Greece and its lenders, which are mostly other EU governments, the European Central Bank and the IMF, are at loggerheads over giving the Balkan country the money it needs to meet upcoming bills. Creditors won’t agree to release some of the 7.2 billion euros still tied to the second, 2012 bailout because the new Syriza-led leftist government wants to renege on the austerity and other stringent conditions agreed to by its centre-right predecessor. The core issue is that Athens – more pointedly, the Greek population – no longer accepts the austerity that has backfired by destroying a quarter of Greece’s economy, boosted the jobless rate towards 30% and strained society, for little of the bail-out money helps Greece; it just rebounds out as debt payments. Thus the first default by a eurozone country could occur within weeks or months, almost certainly by next year. The biggest unknown is almost how controlled any default is. The consequences of an uncontrolled Greek default to official bodies are unknowable, for Greece, Europe, the euro and the world. It’s more likely than not to lead to a Greek exit from the euro. A Greek departure from the common currency could happen slowly in various piecemeal ways or abruptly over, say, a week-long bank closure. What is more certain is that the failure of Europe’s political elite in 2010 to agree to the Lazard-designed debt write-off to private creditors that would have helped Greece bounce back has led to the ultimate dysfunction. Almost all the players in Greece’s misfortune are being forced into decisions that will ensure outcomes they want to avoid. To be fair, it would have been hard for European authorities in 2010 to wear a Greek default that could have shaken Europe’s banking system and put taxpayers at risk to revive a country whose former government had lied about its finances. It’s more likely than not that German-led creditors will agree to give Greece enough money linked to the second bailout to stave off an immediate default. A dénouement of the Greek crisis may herald the political, economic and fiscal integration that is needed to revive Europe and ensure the euro’s future. While a comprehensive deal can almost certainly be ruled out, surely creditor nations can agree to an amicable default by Greece that their voters will back. The reality, though, is that five years of fudges (stretching maturities on Greek debt), half-steps (slashing interest rates on Greek debt) and mistakes (imposing austerity) have run their course of usefulness. The crisis has led to political shifts within Greece and across the eurozone that will make it difficult to negotiate a third bailout, when the extended second bailout expires in June, that includes a Greek default that somehow would get a country with few competitive advantages flourishing again. Investors must prepare for the probability that the Greek crisis will detonate soon enough. The Greek default in 2012 was to private creditors who agreed to write-downs so as not to trigger credit-default swaps that could have caused mayhem. Any upcoming default on the 320 billion-plus euros that Greece owes would be to public authorities that financed the first, 2010 bailout and thus assumed the risk. Greece faces about 15 separate payments before August and if any are missed taxpayers in neighbouring countries will be walloped. For years, Europe’s political elite have told eurozone taxpayers that their prosperity is not at risk from a Greek default, even though it was. The yields on other debt-laden eurozone sovereigns, however, are close to zero, implying no risk of “contagion” from a Greek default, even if much of that is slow acting. (Bond yields should still reflect these risks.) Investors seem assured that so-called firewalls such as the ECB’s untested and qualified lender-of-last-resort power, Europe’s rescue fund and steps towards a banking union will shield debt-heavy countries such as Italy (public debt at 132% of GDP), Portugal (130% debt to output) and Spain (98% debt to GDP). On April 30, Italian, Portuguese and Spanish two-year sovereign bonds were trading at 0.17%, 0.18% and 0.01% respectively. This smacks of complacency even if Greece’s economy is small and few private creditors hold Greek debt. Lehman Brothers was tiny in comparison to the US economy but the company was pivotal enough to rock the global financial system, which was only steadied by radical steps by authorities. Any Greek default that is followed not long after by a euro exit could rend similar global shocks, at a time when central banks (having already cut rates to close to zero) and debt-laden governments have less ability to steady the world’s banking system. So why are the players in the Greek calamity sticking with positions that threaten their self-interest on many levels? Mainly because politics gives them little choice. Take the EU. The aim of ensuring peace and prosperity in Europe drove the enlargement of a united Europe, the (largely) free trade between members and the creation of the euro, often against the wishes of voters. Greece’s entry into the EU and the eurozone was a political decision by Europe’s elite whereby the conditions of entry were waived to cement the EU’s reach into the Balkans. The EU’s western spread is now under threat because Russia has reacted to Nato’s encroachment on its traditional buffer states. The EU can’t afford to lose its Balkan base and no EU official or politician would want to wear history’s blame for forcing out Greece. Yet the EU must risk a rupture with Greece to stem the rise of nationalistic political parties in Europe spawned by the debt crisis, even though it knows a Greek default will fan these anti-EU forces. The ECB quandary is that, as one of Greece’s biggest creditors, it must for political reasons take a brutal line against Greece that boosts the risk of a default and a euro exit. Once any country leaves the euro, the irreversibility of this political project is busted forever. The monetary union just becomes a fixed-exchange-rate system and such systems rarely endure for long. The ECB, at one level, is thus threatening its own existence for it only lasts as long as the euro does. The other dilemma is that an institution that needs to set itself above politics to survive could end up being blamed for political decisions that will reverberate in Europe for decades. The creditor nations, embodied in Germany, must press Greece for three reasons. Firstly, their populations are feeling uncharitable for they are battling economic stagnation at home. Secondly, governments are confronting populist parties that would benefit from a Greek default hitting taxpayers and damaging the credibility of the elite. Angela Merkel’s party, for instance, is losing votes on the right to the Alternative for Germany party whose first policy was for Germany to leave the euro. Finland, which is one of Europe’s worst-performing economies, has just elected a coalition that is propped up by the anti-bailout, euro-sceptic and right-wing Finns party. Languishing France confronts the rise of the anti-euro, anti-EU right-wing National Front. It typically only takes one country to torpedo agreements in Europe. The third and biggest political problem for creditor governments is that they have assured their populations that their wealth will not be squandered on Greece. Creditor nations, however, face the dilemma that if they break Greece they could trigger two booby traps that will cost their taxpayers much more than the amount defaulted. The first stems from the eurozone’s interbank system, known as Target-2. The issues with Target-2 arise because a country’s balance of payments must balance. In the absence of private investment, it has unwittingly fallen on national central banks within the eurozone to balance balances of payments via pseudo euro transfers. These transfers create liabilities for current-account debtors and claims for those running current-account surpluses – namely Germany. In case of default, the ECB would have to write off a defaulting country’s Target-2 liabilities and the cost would be shared among the eurozone’s central banks in proportion to their ownership of capital in the ECB. That’s a big hit for German and other taxpayers. While a Greek default would be bad enough (for its Target-2 liabilities are at an estimated 80 billion euros), a collapse of the euro would wipe out Germany’s wealth claims because there are no laws determining how they would be paid should the eurozone splinter. The second trap is the threat to free trade from a Greek default. A deep concern for Germany, whose exports reach a high 50% of GDP, is that a busted Greece could resort to tariffs to protect its shrunken economy. Berlin worries that other governments under the influence of populists could adopt similar measures that would destroy Europe as a free-trade area. Other debtor nations are pressing Athens because governments in countries such as Italy, Spain and Portugal have imposed austerity on their populations and face populist forces that would benefit if Greece were to gain debt relief. Perhaps Syriza’s biggest miscalculation since it won power in January is that it assumed the support of austerity-gripped neighbours. The Greek government is obviously the hub of the debt talks. The chief constraint on Syriza, which is a coalition that includes some radical leftist parties, is the loyalty of the Greek electorate that backed its promise to unwind austerity and implement measures such as higher minimum wages but which still favours keeping the euro. Athens can’t back down on austerity for the coalition would split and Greek voters may turn to more revolutionary parties. If talks fail to ease austerity, Athens is threatening to hold a referendum to see if Greeks would accept such an outcome. This would only add to the uncertainty surrounding Athens’ brinkmanship with the EU that is roiling Greece’s economy, turning a primary fiscal surplus into deficit by slashing government revenue and intensifying a bank run. The bankrupt government is thus left with pursuing a strategy of risking mayhem via default or referendum to force the EU to ease austerity and abandon asset sales. But it must ensure that any default or vote does not trigger a euro exit. All the while, it is running short of cash, time and possibly public support due to the fact that its confrontational style is failing to win concessions. In theory, Athens can default to the ECB or IMF without the country leaving the euro (just as it defaulted to private creditors three years ago) but in practice it’s hard to see how it could achieve this. A missed payment to the ECB or IMF and Greece would destroy investor confidence, upset the only bodies that can backstop the Greek banking system and call into question loans from Europe’s bailout fund. Such an outcome could test the population’s capacity for hardship, a limit, which crossed, could undermine Greece’s democracy. The numbers say that something must give in the Greek crisis. Political forces are juggling against each other to see how that comes about and how soon. Government debt-toGDP ratios are based on gross government debt and come from Eurostat, “Provision of deficit and debt data for 2014 – first notification”, 21 April. 2015, http://ec.europa.eu/eurostat/documents/2995521/6796757/2-21042015-AP-EN.pdf/2a3922ae-2976-4aef-b6ce-af19bde6a236. Other financial information comes from Bloomberg unless stated otherwise. The Eurogroup of finance ministers and central bankers met in Riga last Friday amidst (accurate) speculation that little progress would be made towards reaching an agreement between the Greek government and its creditors on the measures Greece must (re)commit to in order that the long-delayed bailout tranche of EUR7.2bn be released – enabling Greece to meet upcoming debt repayments and other commitments. Riga, of course, is the capital of Latvia, whose 2008 credit and budget crisis resulted in an IMF bailout conditional on harsh austerity measures that reined in the budget deficit. But the consequent cuts to spending, wages, pensions and services, plus tax hikes required as part of that bailout saw the economy shrink a staggering 18% in 2009. The social cost was devastatingly high, with traditional industries wiped out, unemployment quadrupling to over 20%, and the emigration of 10% of the labour force – mostly the younger generation. Through it all, the Latvian Lat peg to the euro was maintained – an easy fix via devaluing the currency to boost competitiveness was eschewed. Despite widespread community resentment and bitter recriminations, political fallout was not enough to derail the austerity/bailout program, and in 2011, Latvia regained access to financial markets. In 2014, with an economy smaller than in 2008 but growing again, Latvia joined the euro – "proof" to some that austerity works and brings its own rewards. The no doubt coincidental location of the April 24 Greece meeting may have taunted some participants and given encouragement to others, but no complex financial crisis is ever the same. The first Greek bailout in May 2010 came 18 months after Latvia's; and 18 months thereafter, in late 2011, as Latvia exited its bailout, popular kickback against the clumsy brutality of the Greek bailout and the contagion it fuelled threatened the breakdown of the Eurozone itself – by then on the verge of entering a drawn out recession. Compromise, debt restructuring, political change, audacious policy-making and the return of risk appetite over the next three years saw the Eurozone crisis subside and economic growth return, even in Greece. But after five years of recession, the Greek people in January voted in a new government with a mandate to stay in the Euro under renegotiated, less-austere conditions. The Syriza-led coalition, governing Greece for the first time, appears to have a mandate that is undeliverable. It has drawn on its historical ties with Greece's socialist past to nurture links with Russia and argue for the Ukraine sanctions to be eased, throwing a spanner in the works of European foreign policy unity in one of several clumsy attempts at finding a bargaining chip for the bailout talks. After much bad blood in negotiations, agreement was reached on 20 Feb to extend the bailout program by 4 months rather than the 6 months requested by Greece. It was conditional on Greece delivering a list of promised reforms for the next 4 years, such as boosting tax receipts and cuts to government payments, including pensions and privatization. No bailout disbursements have yet been made because no comprehensive and detailed list of measures has yet been provided by the new administration that is acceptable to the creditors who are not prepared to wear any further haircut. The deadline for Greece to submit its reform plans has been moved back several times and now seems to be June 30, when the bailout is due to be indefinitely suspended – whether funds have been disbursed to Greece or not. Although Greece raised limited funds in the short-term market in early April and made a closely watched EUR450mn payment on 9 April, its fiscal position is fragile. The government has taken steps to draw on funds held by public entities such as local councils and public pension funds in addition to rolling over short-dated debt, which is bought by Greek banks using funding from the Bank of Greece (BoG). The BoG in turn is drawing on the ECB’s Emergency Liquidity Assistance program (ELA), through which it lends to Eurozone member central banks so long as it regards the emergency request as being due to temporary liquidity constraints – not solvency. Greek banks are under ongoing pressure from deposit withdrawal. At the 15 April press conference, ECB President Draghi said ECB exposure to Greece was EUR110bn; last week the ECB was reportedly considering pulling the plug on this support for the Greek banks, but it remains in place for now. Westpac’s base case is that both sides of the table, the troika lenders and Greek government, are sufficiently averse to a Greek default and/or exit from the Eurozone that they will eventually reach agreement. (This includes the ECB officials insisting that EMU exit is not an option). Both sides should be able to present a deal as a victory: Greece would receive the delayed funds, while the lenders could cite a list of tough-looking fiscal reform promises by Greece. Most of the movement would probably have to come on the Greek side: it should finally commit to stronger reforms as the least-worst of a range of unattractive options, including yet more elections or leaving the Eurozone (which opinion polls in Greece continue to reject). The catch hidden in this scenario is that no further creditor participation (i.e. debt write-downs) condemns Greece and its creditors to further iterations of current events, with the country's debt burden (including the bailout loans) simply unsustainable into the medium term. A deal by June 30 just starts the clock ticking ahead of the next bailout showdown. If a deal is not reached, or seems impossible, speculation that the ECB will withdraw the emergency bank funding would trigger a renewed run on Greek bank deposits, quite possibly even ahead of any default by the government. The government would impose capital controls, effectively suspending the fiat characteristics of the euro – the first step towards abandoning the currency. Financial and economic chaos in Greece would ensue, albeit with limited contagion elsewhere in the Eurozone. Whether or not Greece leaves the Eurozone soon after would depend on a range of political decisions across the region, but policymakers have made it fairly clear that, whatever the official rhetoric, preparations and planning are underway to deal with the quite significant risk that the irrevocability of the euro is soon tested. It could be argued that such a tumultuous event could, over time, engender a more favourable set of economic outcomes for both Greece and the broader Eurozone. EUR/USD rallied on the Feb deal and should find some support on an agreement to release funds to Greece, whether that is in May or June. But the overarching driver of EUR/USD should be relative monetary policy, which points the pair lower multi-month – our year-end target is 1.02. Crisis postponed. On Friday, Greece, the European Union (EU) and the International Monetary Fund (IMF) brokered a four-month extension of bailout loans to the newly-installed government of Alexis Tsipras. Greece’s bureaucrats now have just 48 hours – until 23 February – to pull together a list of reform proposals. These must be approved by the Eurogroup, comprising all of the eurozone’s finance ministers. Since the Syriza coalition’s election in January this year, Prime Minister Tsipras and his finance minister, ex-Sydney University economist Yanis Varoufakis, have engaged in a tough, no-compromises approach to their EU partners. But the harsh reality of politics meant compromise was inevitable. Unsurprisingly, the weaker player – Athens – ultimately retreated, unwilling to pull the trigger that would usher in a financial apocalypse. Thus, Tsipras and Varoufakis find themselves in a most unenviable position: on the one hand, they must deliver some kind of victory to placate their supporters at home. But, on the hand, both men must know the painful reality: resistance is futile. Regardless of how Varoufakis paints this internecine European struggle – making economic policy as if people matter – the irresistible logic of the situation is that Greece has scarcely any room for manoeuvre, and the most Tsipras and Varoufakis can hope for are minor concessions and weekend extensions. Which is precisely what happened this week. The stand-off between Greece and Europe’s paymaster, Germany, which has insisted upon strict conditionality for the €240 billion bailouts obtained by Athens during the multiple 2009–12 eurozone crises, ultimately led to the rise of Syriza as a domestic political force. In 2005, Syriza could barely attract 4% of the electoral vote. Seven years later, the Tsipras-led Syriza narrowly lost the 2012 election. 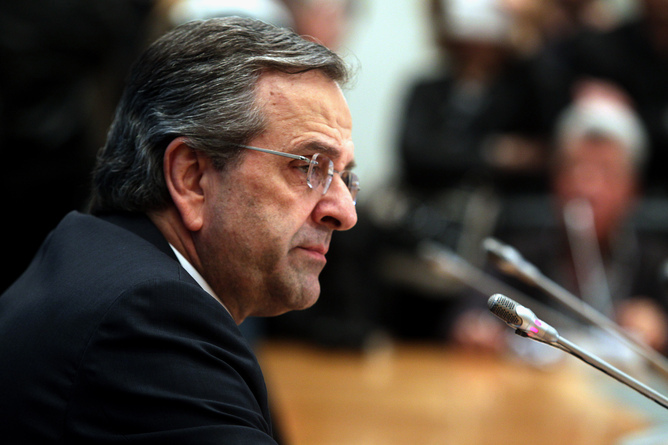 Crumbling support for New Democracy, led by conservative Antonis Samaras, meant Tsipras was effectively prime minister-in-waiting, as voters turned decisively against Samaras’ harsh austerity regime. By May 2014, the European Parliamentary elections confirmed the groundswell of support for Tsipras and Syriza. In December 2014, Syriza forced an early election by orchestrating a minor constitutional crisis. Tsipras swept to power in January this year, promising an end to austerity and renegotiation of the bailout condition, while pledging that Athens would remain in the eurozone. This final point is critical: at no point have Tsipras or Varoufakis ever suggested Greece would exit the eurozone. Nor have they indicated any desire to withdraw from the EU. The reasons are obvious: since 1981, with one exception, Greece has been a net recipient of transfers from the EU budget. In 2013, Athens received over €7 billion euro, while paying in less than €2 billion. These fiscal transfers range from agricultural subsidies to regional development funding. But perhaps more importantly, Germany is the largest net contributor to the EU budget, paying almost €30 billion in 2013. And it is Germany’s massive current account surplus that allows its banks to be the eurozone’s largest creditor institutions. Thus, it is scarcely surprising that Berlin not only wants the biggest say over how the EU budget is disbursed, it also has by far the greatest influence over eurozone policy, which means Greek politicians will be forced to convince sceptical German policy makers that Syriza will honour the bailout conditions signed by previous governments. The most implacable obstacle in Tsipras’ and Varoufakis’ path is Wolfgang Schaeuble, former tax inspector, and Germany’s iron minister of finance. Varoufakis’ and Schaeuble’s relationship did not begin well. At their first summit, Schaeuble said the two had “agreed to disagree". Varoufakis swiftly countered that they did not even agree on that. A note of caution: if you think Germany speaks with one voice on Greece and the eurozone crisis, think again. Since the 1990s, German institutions and political parties have been torn asunder by the divisions caused by what former EU monetary affairs official Bernard Connolly labelled “the dirty war for Europe’s money". As Connolly notes, Europe can have a “transfer union” (in which Germany pays other states’ welfare bills via fiscal disbursements) or it can have a “fiscal union”, where EU member states follow a German system of fiscal confederalism characterised by disciplined monetary policy, mandatory low-inflation targets and strictly-policed public deficits and borrowing. This is Germany’s Pareto-optimal model of how a European monetary and fiscal system should operate. It has been articulated ad nauseam by conservative economists for over two decades. Yet, it exists only in theory. But in 2012, Europe moved a cautious step closer to that model with the promulgation of the Fiscal Compact (in force 2014). However, Germany is divided into at least three camps: anti-euro currency crusaders (mostly university professors and their comrades at the Bundesbank); reluctant participants in the eurozone (the now politically-irrelevant Free Democrats); and those that drove Germany away from the all-conquering deutschmark to embrace the euro currency union in the first place: German industry. The latter group are the most important. German governments never do anything without consulting industry first, a situation that hasn’t really changed since Frederick the Great. In the global recession of the early 1990s, German industry nearly went broke as the deutschmark (DM) towered over its EU and North American counterparts. The bill for German unification and the refurbishment of east Germany was DM3 trillion (six times the Bundesbank and the Finance ministry’s original estimate). Daimler-Benz, Germany’s largest industrial combine, gazed into the abyss in 1994; BMW sank billions into ill-considered British automotive ventures and faced huge losses by 1999, the euro currency’s first year of operation. The chief problem was the exchange rate: the strong DM caused German wage bills to skyrocket, rendering exports uncompetitive. What was needed was an internal devaluation to decrease the cost of German wage labour and reduce the global price of German exports. The euro worked spectacularly well in this respect, losing 30% of its value during its first 18 months of operation (1999–2001). Furthermore, the extension of the EU Single Market to eastern Europe from 2004 saw Germany invest heavily in industrial plant in the EU’s eastern periphery, thus deriving innumerable benefits from low-wage, skilled-labour economies situated within easy reach of the German border. But the euro had precisely the opposite effect upon Greece when it acceded to the eurozone in 2001. It caused an internal appreciation, meaning Greeks suddenly gained considerably greater purchasing power than they had enjoyed under the drachma. The euro also meant the public and private sectors could borrow in both Eurobond and third-country markets at much lower rates of interest. Markets also assumed there would be no sovereign defaults as the European Central Bank (ECB) could act as the lender of last resort, despite the fact that the ECB’s charter expressly forbids this role. Consequently, this provided an incentive to predominantly French and German banks to lend to Greece and the rest of the EU’s southern periphery: Spain, Portugal, Italy and Ireland. This is why Germany will not and cannot afford to allow the eurozone to collapse. Quite simply, it is immersed in the politics of national interest. Instead of off-loading the PIIGS in 2012 and cutting its losses, Berlin responded, belatedly, with due diligence: strict austerity underpinning bailout conditions; a fiscal compact; a financial transaction tax; and, reluctantly, with misgivings, quantitative easing by the ECB. Despite the re-emergence of rumours of a “Grexit”, the news of Greece’s imminent departure from the eurozone has been greatly exaggerated. This is not to say that an orderly exit by Greece could never occur in the future, but it is unlikely precisely because it is in neither Germany nor Greece’s interest for a rupture in the eurozone to occur. This is why the Germans and the French, whose private bank leverage as a proportion of GDP dwarfed that of Lehman’s or Bear Stearns, could not countenance the implosion of the EU currency union in 2012. First, Greece will not leave the eurozone voluntarily. No Syriza or New Democracy politician is advocating that. Bundesbank officials may cattily brief journalists that it is only a matter of time before Greece is unceremoniously ejected, but the Bundesbank detests the finance ministry, while institutional resentment of the disappearance of the DM in 1999, and its consequential impact upon the Bundesbank’s loss of prestige runs deep in Frankfurt. Second, a key point worth repeating is that nothing has changed in the EU treaties since the international financial crisis struck the eurozone in 2009. There is no legal mechanism under Article 50 of the Lisbon Treaty that permits a member state to exit the eurozone, unless that state withdraws altogether from the EU. No state has ever withdrawn from the EU. Third, there is another reason why Greece has no incentive to abandon the euro system and return to the drachma. Fear of a stalemate between Syriza and the Troika has seen Greek business and investors quietly transferring over €2 billion per day in deposits out of Greek financial institutions. The reason is that if a compromise is not reached over the coming months, Greek banks will run out of cash, leading to a shutdown of the financial system. Even more sobering would be the fact that 25% unemployment, a lost youth generation, slashed pensions, structural reform and five years of painful austerity would have all been for nought. Tsipras and Varoufakis know this only too well. They were elected to save Greece. Not to bury it. We have sourced this information from an excellent article from Bloomberg. Understanding who owns the Greek debt is critical in determining whether the Greek elections are likely to cause contagion in the financial system. (Bloomberg) -- Greece’s anti-bailout governing coalition wants to reduce the country’s debt burden. Who’s on the hook if they succeed? Prime Minister Alexis Tsipras has pledged to repay in full obligations to the International Monetary Fund and the European Central Bank. Finance Minister Yanis Varoufakis outlined plans to swap some debt into new securities and link repayment with economic growth. Both have said private investors won’t be asked to shoulder additional losses after taking the hit in two restructurings since the start of the euro financial crisis. Euro-region governments and the crisis-fighting fund they set up in 2010 are owed almost 195 billion euros ($221 billion) by Greece, mostly in emergency loans. That’s about 62 percent of the total debt and compares with 17 percent held by private investors. Governments and national central banks are also contributors to the ECB and the IMF so taxpayers would be exposed should Greece go back on its pledge to make those creditors whole. Here’s a list of frequently asked questions about Greece’s debt profile. The answers are based on the latest available data from the country’s Finance Ministry and Statistical Authority. Q: How much does Greece owe? A: Greece’s total public debt amounted to 315.5 billion euros at the end of the third quarter. Q: Who is Greece’s largest creditor? A: The European Financial Stability Facility, the euro area’s original crisis-fighting fund, which has lent the country 141.8 billion euros, and hence owns about 45 percent of its debt. The average maturity of EFSF loans to Greece is just over 32 years, with the last payment due in 2053, according to the EFSF’s website. Greece pays about 1.5 percent on those loans, comparable to what a AAA rated country would be charged. The rate fluctuates based on the EFSF’s own borrowing costs. Q: When is Greece scheduled to start paying principal on the EFSF loans? A: Not until 2023. It also enjoys an interest deferral on most of the loan. The exception is a 35.5 billion-euro chunk that was paid to private investors in 2012 to persuade them to accept the restructuring. Because of the grace period already in place, any writedown on the debt held by the EFSF will have relatively little impact in easing the Greece’s debt-servicing costs over the next eight years. Q: How much of Greece’s debt trades among investors? A: After the biggest debt-restructuring in history, in which securities totaling about 200 billion euros suffered losses, Greece’s tradeable debt is now just 67.5 billion euros, 82 billion euros if treasury bills are also included. The ECB and euro-area central banks currently own about 27 billion euros of Greek bonds, according to data compiled by Bloomberg, comprising 40 percent of the total outstanding market. Q: How about the ECB? A: During 2015, Greece is set to repay 6.6 billion euros of bonds held by the ECB. By year-end the ECB would own 20.4 billion euros out of a total 60.5 billion euros of tradeable bonds, assuming no new issuances by Greece and other small bonds are repaid as they mature. Q: Wasn’t the ECB debt already restructured once? A: Yes, albeit indirectly. The ECB and euro-area central banks bought Greek government bonds at the peak of the crisis at prices below their nominal value. While Greece is required to repay these bonds at their nominal value, the central banks would then return the profits they made on the transactions to their shareholders, which are euro-area member states. The ECB has always resisted agreeing to a voluntary haircut on its debt because that would be considered monetary financing, which is banned under EU law. Q: How does the payback work? A: These shareholders must give Greece back this profit, as long as the country complies with its bailout agreements, according to a euro area finance ministers decision taken in November 2012. In this way, Greece ends up repaying less than the full amount. In 2014, Greece was scheduled to receive about 2 billion euros in ECB-profit returns. It never did, as the bailout review was never completed. Q: Treasury bills are tradeable, how many are there? A: Almost 15 billion euros of Greece’s debt consists of short-term T-bills, which the country continuously rolls over. This covers financing needs while its bailout review remains stalled, and no aid disbursements are being made from the euro area and the IMF. Q: How much does Greece owe to the IMF? A: Almost 25 billion euros, according to the fund’s website. The IMF’s policy is to never restructure its loans, and Tsipras said he doesn’t intend to test the fund’s resolve. Greece is scheduled to repay about 19.4 billion euros to the IMF by 2019, and another 6.4 billion euros between 2020 and 2024. Q: Does Greece pay interest? A: The interest paid on IMF loans is also not fixed, and depends on the amount outstanding and the length of time since the money was advanced. The average rate varies between 3 percent and 4 percent, according to a person familiar with the matter. Q: What about bilateral loans? A: In May 2010, euro-area members agreed to provide bilateral loans pooled by the European Commission, after Greece was shut off from international bond markets. The so-called Greek Loan Facility included commitments of 80 billion euros to be disbursed between May 2010 and June 2013. This was eventually reduced by 2.7 billion euros when Slovakia decided not to participate and Ireland and Portugal stepped down after they requested their own rescues, according to the Commission’s website. Only 52.9 billion euros were disbursed before the GLF facility was replaced by the EFSF bailout. Tsipras’s commitment to repay Greek loans didn’t include EFSF or GLF loans. Q: How much could each creditor nation lose? A: A precise calculation of the potential liabilities of each member-state would have to take into account the impact of contagion from a Greek default, the consequences for European banks and the precise amount for which Greece will forsake repayment. Q: But haven´t some made estimates? A: Some countries have done their own math. French Finance Minister Michel Sapin says his country’s exposure is 42 billion euros. Finland, which demanded collateral for its loans to Greece, has a total liability of 5.4 billion euros, according to Finance Ministry data and Bloomberg calculations, including the country’s contribution to the first and second bailouts and its share of the IMF loans. The Netherlands contributed 3.2 billion euros in the first bailout loan and the Dutch guarantees on the EFSF loans and interest total 33.6 billion euros. NOTE: These figures are approximate because a small part of Greece’s debt is denominated in currencies other than euros or in the IMF’s Special Drawing Rights. The breakdown doesn’t include some state guarantees for liabilities of government-owned entities, including public utilities, or European Investment Bank loans, which were channeled to infrastructure projects and financing of businesses. As had been widely predicted, the left-wing party Syriza has secured a victory in the Greek election. Having finished with just short of enough seats in parliament for a majority, leader Alexis Tsipras has agreed to form an anti-austerity coalition with the right-wing party Greek Independents. Throughout the short campaign, it appeared the relative newcomer to Greek politics, led by the charismatic Tsipras, would win. Now it appears he has done so by a significant margin. Speaking in the wake of the victory, Tsipras said the vote would end years of “destructive austerity, fear and authoritarianism” and that his country could now leave behind the “humiliation” it has suffered. The last half of 2014, which became essentially a prolonged general election campaign, saw the Syriza leadership (especially Alexis Tsipras) toning down its extreme rhetoric. Instead of pushing for radical reform, it focused on promising simply to abandon austerity and challenge Greece’s external debt commitments. Syriza has pledged to tackle what it calls Greece’s “humanitarian crisis”. It plans to feed and house the worst affected by the crisis, providing them with free electricity and medication, and reintroducing a higher minimum wage. Internationally, it has promised to bring Greece’s creditors to the negotiating table, with the intention of thrashing out a deal more favourable to Greece. In essence, this will amount to requesting debt redemption, or a “haircut”. This toned-down platform may have won Syriza the election by attracting enough of the political centre, but it may not be enough to sustain the support of the more radical elements in the party’s leadership and political base. The worry is that the whiff of power may not be strong enough to placate radical elements, who really do want radical domestic policies. They would like to see austerity abandoned and replaced by increased government spending across the board, and the restitution of public salaries and pensions. The public sector workers made redundant over the past four years would be re-employed and state property nationalised. They also want a more confrontational policy towards Greece’s creditors and the so-called troika (the EU, the European Central Bank and the International Monetary Fund). This could ultimately result in the dreaded Grexit. If Syriza’s more radical elements feel betrayed by watered-down policies, the party faces the prospect of internal division, and Greece could soon see social unrest and demonstrations. That would weaken the new government dramatically, and could further destabilise the country at a very delicate moment. Despite the scene of triumph, Greece is entering a period of deep uncertainty, and Syriza’s victory may indeed turn out to be pyrrhic. It is confronted by the immense task of governing at a time when Greece may be ungovernable, while also facing a potentially divisive internal struggle. International partners have also made it clear that the new Greek government, whatever its makeup, will have to honour the country’s existing agreements and commitments. If Greece’s international creditors don’t come through with quick concessions, or if radical opposition rears its head against Syriza’s more moderate approach, this could trigger an uncontrollable reaction based on fear of uncertainty. That could lead to an accidental default, which would have disastrous consequences for Greece. Cyprus has clinched a last-ditch deal with international lenders to shut down its second largest bank and inflict heavy losses on uninsured depositors, including wealthy Russians, in return for a €10 billion ($12.4 billion) bailout. Swiftly endorsed by euro zone finance ministers, the plan will spare the east Mediterranean island a financial meltdown by winding down Popular Bank of Cyprus, also known as Laiki, and shifting deposits below €100,000 to the Bank of Cyprus to create a ”good bank”. Deposits above €100,000 in both banks, which are not guaranteed under EU law, will be frozen and used to resolve Laiki’s debts and recapitalise Bank of Cyprus through a deposit/equity conversion. The raid on uninsured Laiki depositors is expected to raise €4.2 billion, Eurogroup chairman Jeroen Dijssebloem said. “It can’t be done without a bail-in in both banks . . . This is bitter for Cyprus but we now have the result that the [German] government always stood up for,” Mr Schaeuble told reporters, saying he was sure the German Parliament would approve. Conservative leader Mr Anastasiades, barely a month in office and wrestling with Cyprus’s worst crisis since a 1974 invasion by Turkish forces split the island in two, was forced to back down on his efforts to shield big account holders. The EU and IMF required that Cyprus raise €5.8 billion from its banking sector towards its own financial rescue in return for €10 billion in international loans. The head of the EU rescue fund said Cyprus should receive the first emergency funds in May. With banks closed for the last week, the Central Bank of Cyprus imposed a €100 per day limit on withdrawals from cash machines at the two biggest banks to avert a run. “To all those who say that we are strangling an entire people . . . Cyprus is a casino economy that was on the brink of bankruptcy,” he said. Analysts had said failure to clinch a deal could cause a financial market selloff, but some said the island’s small size – it accounts for just 0.2 per cent of the euro zone’s economic output – meant contagion would be limited. Cyprus’s banking sector, with assets eight times the size of its economy, has been crippled by exposure to Greece, where private bondholders suffered a 75 per cent “haircut” last year. Given that Cyprus's GDP is less than a quarter of the market capitalisation of the CBA, plus the fact that most of Cyprus's bank deposits were not widely held by foreign banks, it is difficult to see this situation contaminating global financial markets.